Parco Ruffini, known locally as ‘il Valentino Nuovo’, is a large park in the Italian city of Turin, which contains the Stadio Primo Nebiolo, which has mainly used for athletics since it was built in 1959. The facility has a running track, indoor pool, fitness facilities as well as an indoor track below the surface which was originally used as sanctuary from air raids in the War. The stadio regularly stages the games of Torino’s ladies section; Torino Calcio Femminile as well as American Football games for Giaguari Torino (Turin Jaguars). On the 3rd of May 1980 the stadium staged an impromptu free gig for The Clash which 6,000 fans attended. The arena was upgraded around the millennium with bucket seating fitted on the terracing and a roof put over the main straight side. 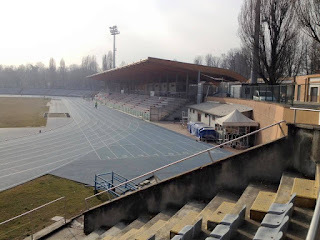 While Parco Ruffini sees thousands of local residents go out to relax and use the facilities on offer and the Stadio Primo Nebiolo sees athletes working out, it will be forever remembered by a thousand or so England fans during Italia 90. The Italian authorities had provided free campsites in most cities for the tournament. This would be the one in Turin for England supporters for the semi-final against Germany. I was in Italy with my young brother Nick. We had met up over the previous week with some great lads from all over the country who supported different clubs; Darren (AFC Bournemouth), Billy (Leeds United), Brian (Aston Villa), Keith (Millwall) and John (Portsmouth). There were others who we got to speak to regularly, but this was our little gang. After England defeated Cameroon in Naples we had an epic overnight train journey first to Rome, before changing for Turin. We camped out in our own compartment, which kept guards and locals away. Hygiene wasn’t at its best by this stage! The trip had seen the first train break down and us having a play on the side of the tracks as well as getting a well deserved beer after the ban was over. On reaching Turin, Brian seemed to know the way to the site. There were brochures for each city, but we would have been hopeless without the Villa man's general common sense. We got there by tram and then walked up. The first issue was tickets for the big match. 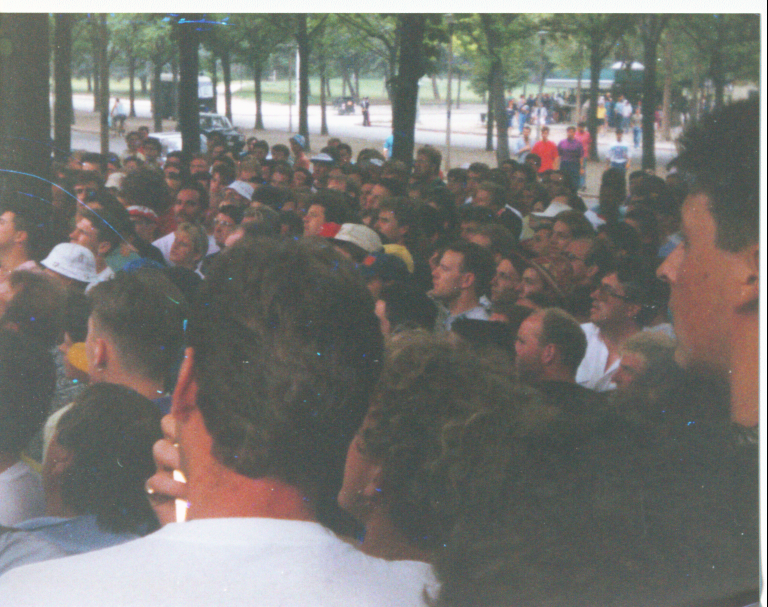 The concrete booth being used by the authorities and the FA was surrounded by fans desperate for news. The film crews from back home were getting reactions from exasperated supporters. An FA rep told the crowd that they were trying to negotiate more tickets but the original allocation was sold out. Billy was from Rugby. Along with Brian and Darren they’d been there all the way through. Nick and I only arrived after the group stage. Billy’s two mates had gone home as they’d had enough of the Italian authorities treating England fans like dirt. They had left their tickets with Billy. He let Nick and I have them after he saw the chaos ensuing. We had to be discreet on the subject. There was a threat in the air of those without and desperate might do anything to get their hands on one. 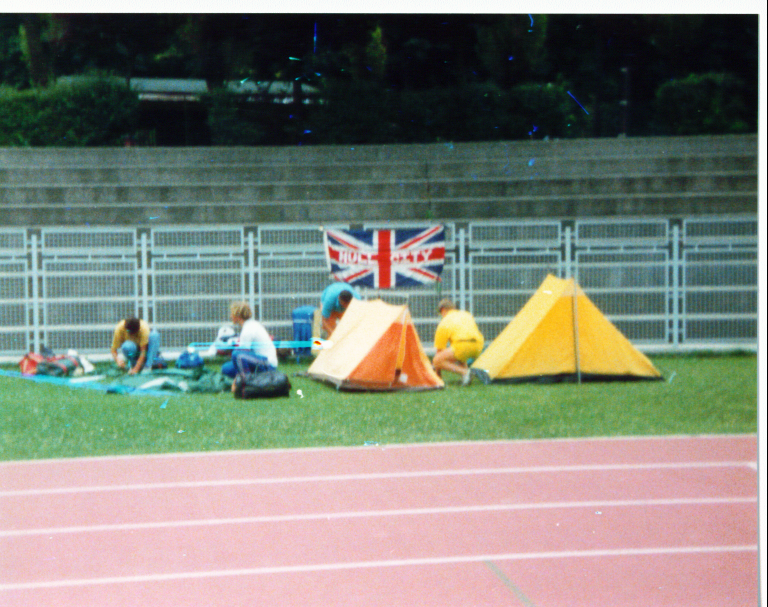 We went inside the stadium and set up camp on the grass by the fence behind the goal. The snack shop inside the stadium was basic and an alcohol ban was in place. One bonus of being put inside the stadium was that it had toilet and shower facilities as well as a fully marked out football pitch with goals and a running track. Some really athletic lads had a jog, while a football match kicked off on the pitch. I was happy to bag a couple of goals on Italian soil, but by tea time the game had descended into a hundred-a-side clash! Turin was probably not the best idea for a match involving England. It was only a few years after thirty nine Juventus fans had been killed at the European Cup Final against Liverpool. English teams had been banned from European competition for five years. 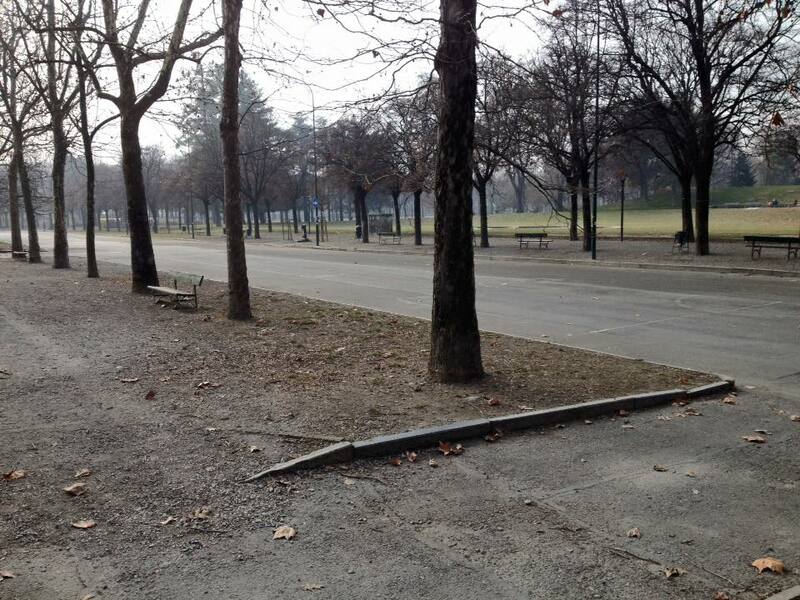 The Turin authorities tried to expel any fears of any revenge attacks and said in public that they had control of the situation and that all visitors were welcome. While it was just about OK to walk to the basic local shops, venturing far was definitely not a wise idea, and finding a local bar was completely out of the question. However, we saw a window of opportunity to go out when Italy played Argentina in the other semi-final at 6.45. 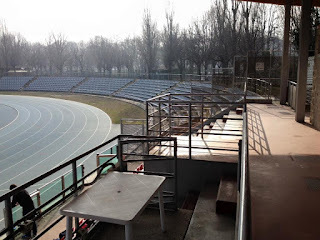 I had this idea of visiting the old Stadio Olimpico that had been shared by Juventus and Torino until the end of the 1989-90 season. Some of the others agreed, so off we set. As predicted the streets were empty. We did get inside for a look, which you can read about here. There was no time to hang around, so we headed back to our site without even knowing the score in the match. 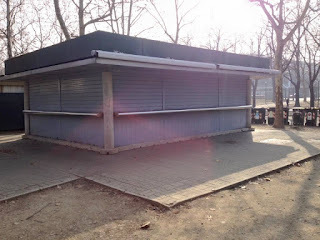 The park had a bicycle hire shop for kids and the door was open to the offices. Many England fans were inside with the proprietors watching the semi-final on a black and white portable TV. We squeezed in as the game went into extra time. Our hosts were Torino fans and most hospitable. The game went to penalty kicks. Maradona had pleaded the people of Naples where the match was being held to support him and his team as he was like a God in the city after his spell for Napoli. This made him public enemy number one with most Italians. How we laughed when he scored his spot kick. Many ordinary Italians we had met on the trip had been fine, but the authorities and the Caribinieri had been absolute tossers, for want of a better word. Their heavy handed tactics along with the local hooligans in some locations meant that all England fans were desperate for Italy not to lift the trophy. Two Italians missed their kicks and Argentina won. They must have been able to hear the cheers in the city centre from our crowd. “Argentina, Argentina” boomed out. Bearing in mind the history on and off the pitch that we’d had with that particular nation, said something about how we felt about the Italians. Someone suggested we jumped on the kids bikes and rode round ringing the bells, but we knew it was time to get back inside the confines of the stadium. The locals were not going to let this go. The next three hours were frightening, nasty and in some ways exhilarating. It was the nearest I’d ever come to war. 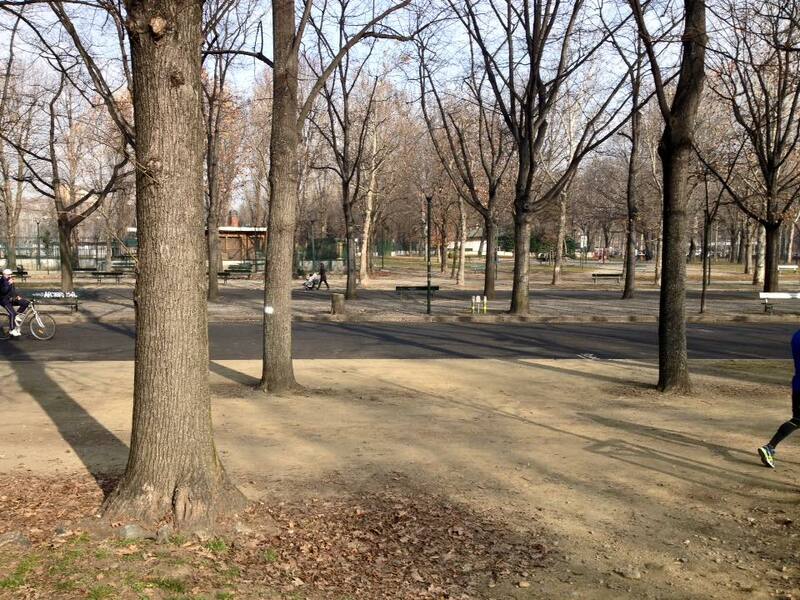 The locals tried to attack the park from all angles. We had a bit of a problem as the track was surrounded by high fencing with just a few gaps. We needed to be up the terracing and defending our ground. All manner of missiles started coming over. As it was dark it was difficult to see exactly what was going on, but the guttural roars at different locations and police sirens told us where the crowds were; basically all three sides surrounded by the park. The Caribinieri decided that firing tear gas was a good idea. I’d never experienced tear gas before and I never want to again. I felt like I was choking until I could get some water. Ironically enough some of the older lads there had been tear gassed in Turin in 1980 at the European Championships. There was turmoil on the pitch as the goalposts were torn town to use as missiles in return. There was a huge scuffle as it was said that a couple of Italians had got inside and tried to kive an England fan. After a few hours it seemed to calm down. We squeezed into the tents and tried to get some sleep. It had been some night. It later transpired that more Italians had been arrested that evening than at the rest of the tournament. The following morning Nick and a couple of others went away to Milan for the day. I wasn’t a big fan of the idea at the time, but in hindsight they had a good plan. It was horrible on the site. We were relieved to hear that the previous evening hadn’t been latched onto back home. I fully expected England to be kicked out of the tournament. They didn’t need many excuses. It was a long old day. There was a bit of football going on but the goalposts were now missing! It was case of wandering around and chatting. The showers were stone cold, but fortunately the weather was good. Card games were going on while a few ghetto blasters played music. I’ll forever remember the moody tunes of Pink Floyd playing out as the smell of dope lingered in the air. Some spirits that had been smuggled in were being consumed. Our posse were dry. Eventually it was time to head to the game, which can be read about here. The night after the match was awful. I was absolutely distraught and physically and mentally shattered. There was a couple of alerts that the Italians had come back for another go, but there was a heavy police presence all around. 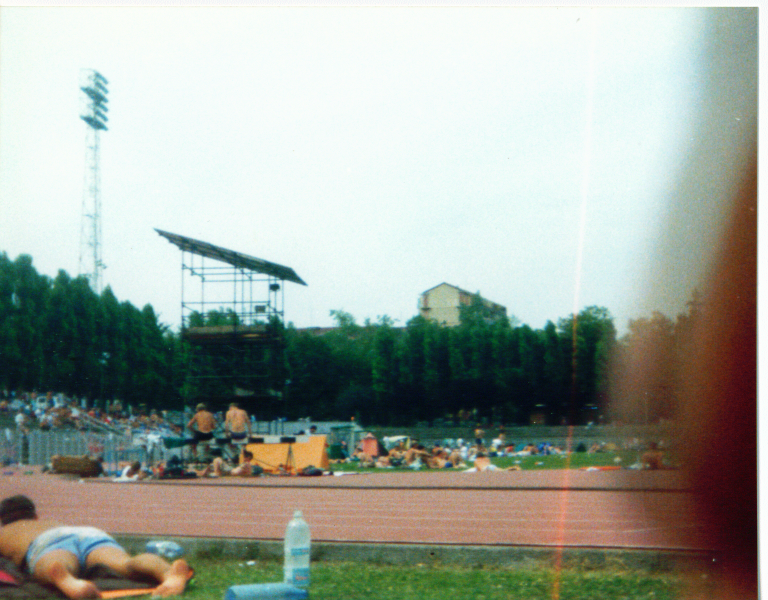 For safety we slept on the concrete terraces near the facilities. The following morning we all decided to head to Milan as Nick said that they’d managed to get inside the San Siro for a look the previous day. I’m sure the feeling was mutual when we were glad to board a train and leave Turin. 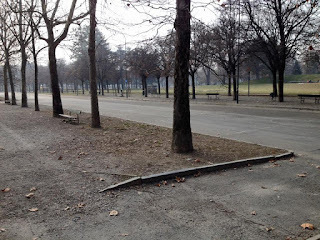 Since the infamous semi-final I had since returned to Turin and found it a really beautiful city. I had returned once again, this time to take in a Juventus home game. 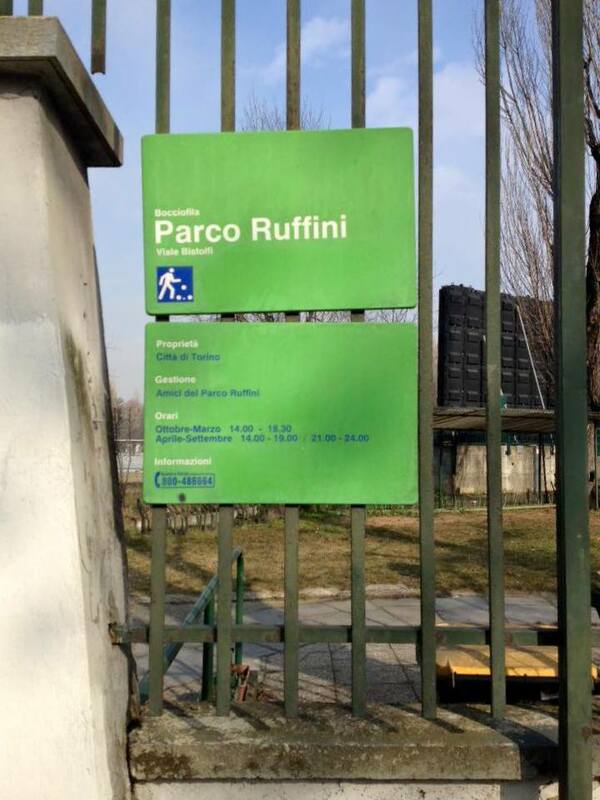 I had the day before the game to adventure, so along with three local amateur grounds, I decided to revisit Parco Ruffini. Taking the number 2 bus from Rivoli the journey went down Corso Trapani before arriving at the park just five minutes later. It was time to reminisce. 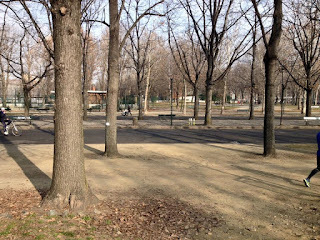 The park looked really nice and I was immediately glad that I had returned. Walking past the ticket booth I went round to the entrance, which I was delighted to see open. I went inside to take some pictures as the memories came flooding back. 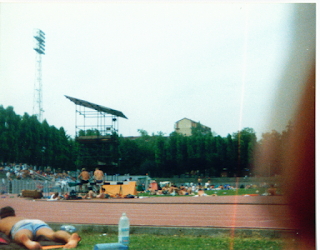 The stadium had been upgraded with new seats and a roof over the entrance side, which would have been handy during our stay in 1990. The high fences around the track had also gone, which showed how much we’d all come on since those darker days. The running track had also been relayed and was now azzurri blue. I left the training athletes to get on with it and headed up Via Matilde Serao past the shops we’d used to catch the tram 15 back into the city for some cultural sightseeing.